Resonate Gala Concert this Wednesday. Winter Concert two weeks away Dec 11th. The Division “Song” Class and Senior Percussion Ensemble will be performing this coming Wednesday at the Bassment Jazz Club in Saskatoon for the Annual Resonate Gala (fundraiser) concert. Come out and cheer them on as they join students from across the entire division and the Staff House Band. Tickets may be purchased from your school office or from your Music Teacher. Just a reminder to all grade 7-12 students our penultimate division band rehearsal and curricular classes at Allan before the winter concert is tomorrow. It is vital all 7-12 students attend. We will also be rehearsing for the Resonate Gala concert, next Wednesday November 29th. The song class and percussion ensemble will be taking part. With apologies for the late notice there is unfortunately no grade 5/6 Retreat on November 22nd. All grade 5’s and 6’s will rehearse and have pictures at the Term 1 performance -Winter concert. THERE IS DIVISION CLASSES IN ALLAN FOR GRADE 7-12. The Winter Concert takes place on December 11th at Lakeview Church at 7pm but students will be bused directly from their home school at the end of the day to Lakeview church. They will however need taking home after the concert. 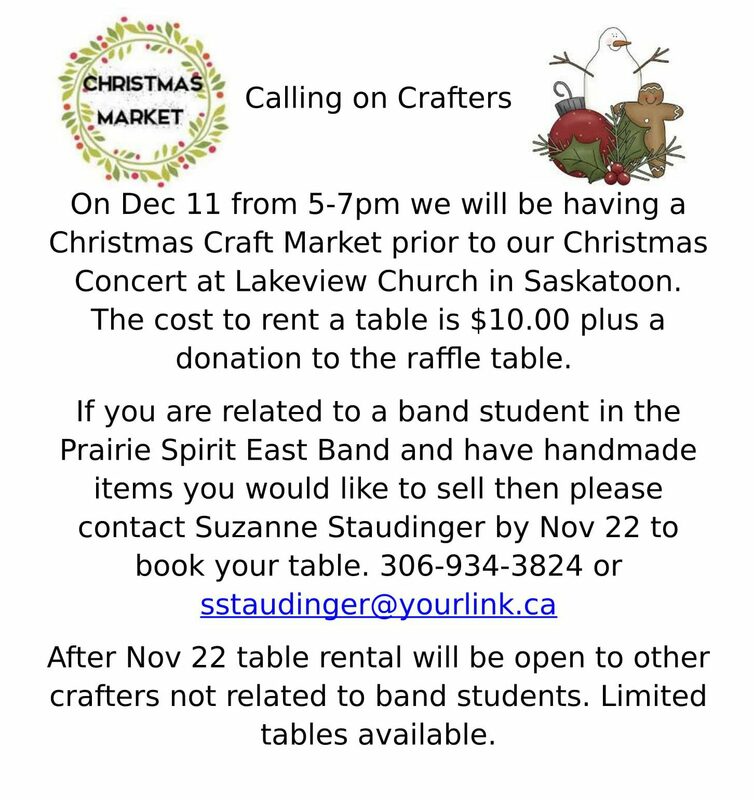 There will be a winter market in the lobby before the concert any interested vendors please contact one of the Band Parents and see the below information. What? – Term 1 performance and Winter Concert for all Music Students at Lakeview Church. Who? All music students from Grade 5-12. Grade 7-12: Black Pants, Socks and Shoes (no runners) Division Polo shirt will be provided. 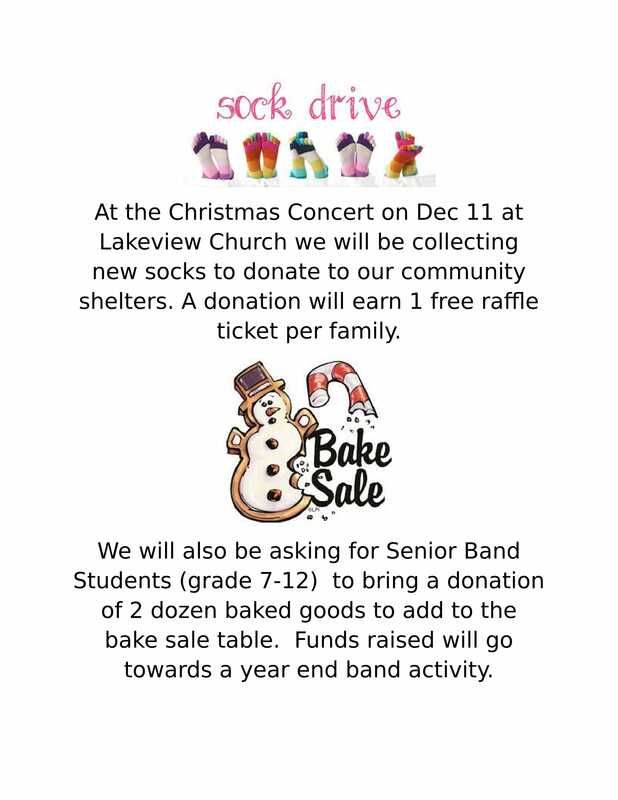 Music, Instrument, Concert Dress, Supper or spending money for the winter market, Socks for the sock drive, baking for the bake sale (7-12 only). Band Pictures will take place prior to the concert at Lakeview Church. You can order using the below form. Please hand in your forms to your band teacher or school admin assistant no later than December 8th. This coming Wednesday is Division hub classes in Allan. Students are working on their Winter Concert repertoire and are continuing work on their individual skills for term 1. November 29th – Resonate Gala Concert 7pm @ Basement, featuring PSSD East Percussion, Song Class and Wind/Brass Small Ensembles. Tickets available at any school or through your band teacher.